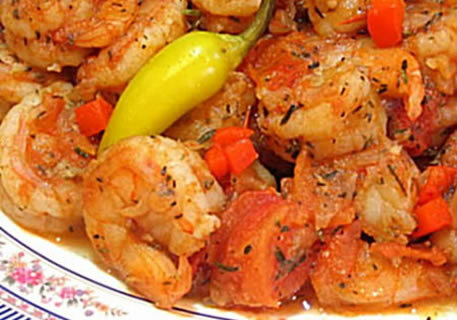 When a dish is referred to as a la mexicana, it is made with tomatoes, onions and chiles, combined here with the plentiful shrimp from the coastal waters of Mexico. 3 tablespoons chopped parsley canned chiles güeros. - Heat the oil in a large saucepan, add the onion and garlic and sauté for 2 minutes or until transparent. Add the tomatoes and cook over medium heat for 5 minutes, stirring constantly. Add the pepper, bay leaves, thyme, salt and chile juice. Cook, covered, over low heat for 5 minutes. Correct the seasonings. - Before serving, melt the butter in a skillet and lightly sauté the shrimp. Add the shrimp to the hot sauce and simmer for 3-4 minutes or until the shrimp are cooked. Sprinkle each serving with chopped parsley and garnish with a chile güero.